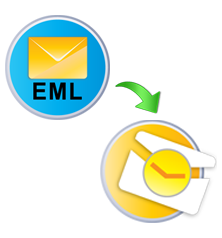 EML to PST Converter is a flawless solution designed to export EML file into Outlook PST format. This software allows a user to load multiple messages from EML files automatically. It is also compatible with all versions of MS Outlook. Demo Version of the software that can migrate only 10 email messages from each folder. The EML to PST migrator tool will generate an instant preview of multiple emails before importing and simply view all emails in different modes such as Normal, Hex, property, MIME, HTML etc. Also, it enables the user to import emails into Outlook along with attachments. With EML to Outlook converter, users can sort all messages by its program attributes i.e., To, From, Subject, Sent Date, Received Date and Size in KB. Using this feature, users can choose only necessary emails and then, import .eml files into Outlook .pst. The application can support multiple email platforms, which can save particular data in EML format file. Each mail client support .eml file that can be totally supported by different platforms i.e., EML to Outlook, Thunderbird, Outlook Express, Eudora, etc. Does this software impose any size limitation on Outlook PST? No, there is no restriction on size of output .pst file that the software creates. 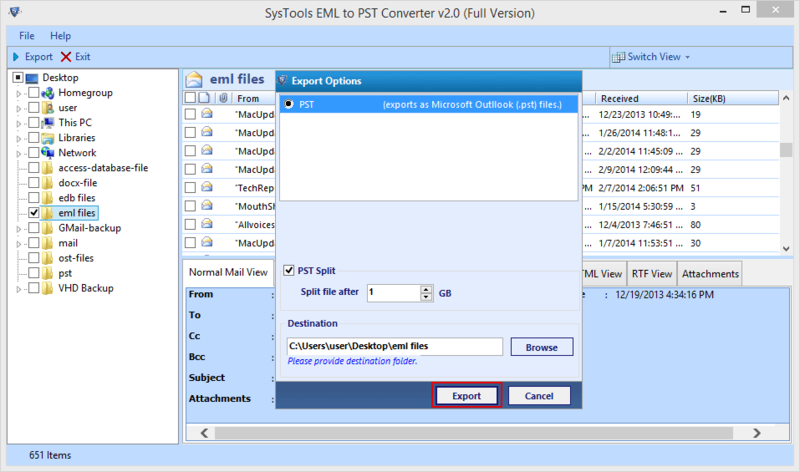 So, users can easily import .eml files into Outlook PST without any size limitation. Is it mandatory to have an installation of MS Outlook while importing EML files into PST format? No, not at all, the software is capable enough to convert email messages into .pst format without Microsoft Outlook installation. 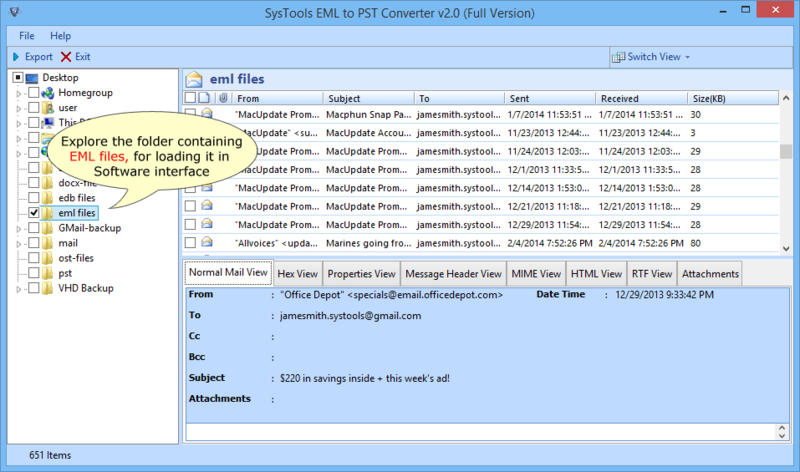 With this converter tool, can I export multiple EML files to PST format? 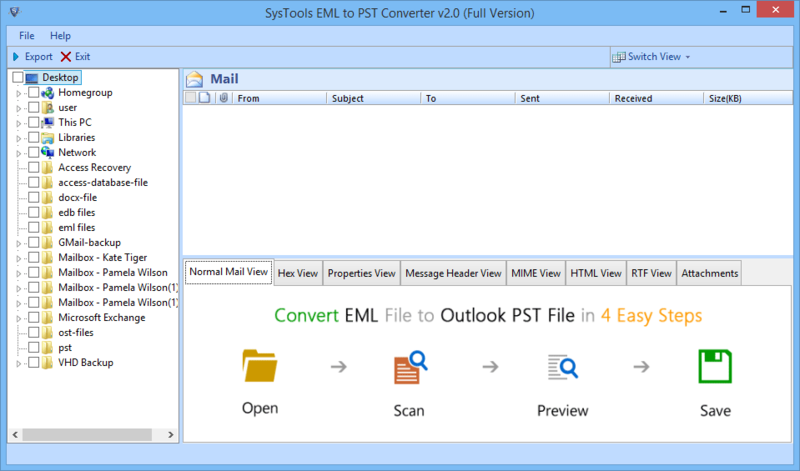 Yes, Of course, users can convert one or more .eml files to .pst using EML to Outlook PST converter tool. Will this converter tool maintain the folder structure during file migration? Yes, out product will retain the folder hierarchy and message formatting while converting the resultant file into PST format. "On behalf of someone else, I would like to share my opinion on this product. EML to PST converter is an incredible solution, this will retain on-disk folder hierarchy and also keeps the message formatting. It will also transfer .eml files into Outlook PST type. I really appreciate this tool and wants to thank the development team for creating such an amazing technique. However, it is having an interactive user interface so that a non-tech user can run it without having any technical knowledge. Great work!!" "I was so exhausted from some other applications to perform conversion from EML to Outlook PST. At that time, one of my friend recommended me such a wonderful tool i.e., EML to PST Migrator that works really good. The best part of this software is users can migrate selected items or folders of EML file to the Outlook PST. Now, I can easily accomplish my task with this robust tool. Genuinely, big thanks to all team members for providing us a trouble-free solution."